At a time when the dietary supplement industry faces ever-growing scrutiny, there is a lot of discussion about what can be done from within the industry to self-regulate. Despite having arguably adequate regulations in place, many would agree that the low level of enforcement of those regulations might be the biggest issue. And while the appropriate enforcers (e.g., FDA and FTC) may not have the resources necessary to police the entire industry, others have stepped up (e.g., State AGs, plaintiffs’ attorneys, task-force groups, etc.) with varying agendas. As those outcomes rarely serve the industry or its consumers well, we have seen more movement towards industry self-regulation. These self-regulation efforts include things like mechanisms for challenging advertising claims among competitors, unofficial cGMP standards for raw materials suppliers, and repositories for label and manufacturing data. The end results of which will hopefully promote more compliance with dietary supplement manufacturing and advertising, but also improve consumer confidence in the products and industry. Industry self-regulation is fantastic, but not the topic of this article. The topic is actually the opposite – industry self-deregulation. That’s right. While regulatory affairs and quality professionals work tirelessly to make and keep companies compliant with the regulations, there are active forces from within our own industry that not only promote non-compliance, but also force it upon companies with contracts and refusals to do business with them. Now these might sound like strong accusations, but they are in fact very real, and far too common. However, it must be said that those involved in creating the instances of forced non-compliance are generally not aware of what they are requiring, or sometimes just of the opinion that the compliance issues are insignificant in terms of risk. These forced non-compliance issues can be seen from time to time in all of the critical regulated areas such as labels, claims, and manufacturing. At DSE, a lot of our consulting work focuses on label compliance reviews, so I’ll present some of the areas where we see this frequently with clients in the label area alone. The first offender can be your contract manufacturer. The majority of dietary supplements on the market are made by contract manufacturers. As a brand owner, it is your duty to ensure that your products are made in compliance with the cGMPs. To earn your trust and business, contract manufacturers invest heavily in the equipment, quality control, and expert personnel needed to make dietary supplements. However, it is quite rare that they further invest in an expert to make sure that your labels are compliant – as they are squarely your responsibility. They will generally provide enough information on your product that a compliant label can be made. A good manufacturer will disclaim this, and recommend you seek expert help with your label. A dangerous manufacturer will lead you to believe that sticking their content on your label without further review will guarantee compliance. The most dangerous though, are the ones (especially the private labelers) that will not release your product to you until they have provided a review of your label, and will reject your label for any slight deviation from what they want from you. In every case of this that we see, the manufacturer has demanded that the client 1) not be allowed to use a compliant label, 2) maintain their non-compliant Supplement Facts panels and/or ingredient statements, and 3) forget about the product if the labels aren’t approved. It creates quite a conundrum for clients. The second offender can be you raw material supplier. This usually only occurs when your product contains a trademarked material. While you pay the additional price of using these ingredients for better marketability, claims support by clinical studies, and overall better compliance – you might end up being forced right back out of label compliance. The way this happens is that in order to use the trademarked ingredient, the supplier will require you to sign a trademark usage and licensing agreement. In this contract, at times you will be required to label the ingredient in a very specific way in your Supplement Facts panel that might not be in a compliant manner. This might violate the regulations in terms of the naming of the ingredient (not a common or usual name, or not a standardized common name for a botanical ingredient), usage of intervening material (added marketing language or trade name), or something different. 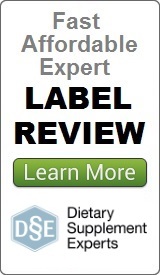 Before printing your labels, the suppliers want to review and approve your labels. If you have deviated from the agreement, they may reject your use of the material based on the labeling. The third offender can be your retail distributor. When your products find their way to retail distribution, part of the process can include label review. We have helped out with label compliance readiness for many companies in retail, and have seen the varying degree of expertise displayed by the retail reviewers. The ones that are extremely technical and conservative are our favorite, but those that come back with comments for change that are outside of compliance are difficult to deal with. Sometimes this seems to be confusion with conventional food labeling rules, other times it can be less clear where it involves maybe just misinterpretations of the regulations, or drawing from the non-compliant practices of other brands currently distributed by the retailer. In any case, retail distribution is a big thing, so trusting them and complying is an easy approach, but creates risk nonetheless. So what is a company to do when unnecessary label non-compliance is forced onto you? To start, you must know the regulations to have a chance of fending it off, or at least someone in your corner that does. Then, when it happens, hopefully you can present a reasonable case to the offender, and get them to recognize their error and make a compromise. In the best of cases, they may appreciate your perspective, and possibly appreciate the challenge and outcome. In the worst of cases, they might be inflexible, and you might need to navigate away. If you need a second look – or even first look – over the compliance aspects of your dietary supplement products, please contact us and see how we can help. Posted in Articles and tagged contract manufacturer, FDA, ingredient supplier, retail, Self regulation.